Observing the behavior of the United States over recent decades, it becomes clear that the American establishment has always relied on two fundamental factors to justify choices in foreign policy. We have been accustomed in recent years to humanitarian interventions being justified on the assumption that the United States and the West were in some way intervening militarily in the interests of defending innocent civilians from brutal dictators. This justification for armed intervention has either been the key factor or the direct cause for the expansion of US imperialism. The use of the media as an instrument of war – with lies, artfully constructed stories, intentional omissions, and targeted disinformation – has helped US imperialism to justify armed interventions abroad. There is always some sort of justification, rationale or pretext offered when Washington intervenes to bring about conflict. These excuses were showcased in Yugoslavia in 1999, in Afghanistan in 2002, in Iraq in 2003, and in Libya in 2011. With Yugoslavia and Libya, the lie of protecting human rights was the justification offered to the public. The September 11, 2001 attacks were used to justify attacks on Afghanistan and Iraq in 2002 and 2003, pointing the finger of blame at these countries. The war on terror in general offered a perfect justification for bringing about chaos in every corner of the world. Naturally, these are excuses meant to be peddled in the international arena. There is no justification for bombing a nation, completely destroying its services and infrastructure, and killing tens of thousands of its innocent people. 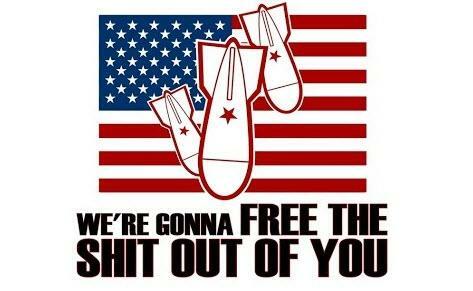 But US imperialism works like a steam-roller. The artful fabrication of a humanitarian cause gives the green light to rain down bombs to save the poor and downtrodden civilians. All this is possible thanks to the nauseating and false media rhetoric that creates the ideal conditions needed to justify the horrible war crime that is aggression against a sovereign nation. Such justifications constitute some of the most deceptive and aggressive imperialist tools employed by the Euro-American power conglomerate to impose its unipolar vision of international relations and strong-arm those seeking a new path in international relations. The objective is to disrupt (with bombs and propaganda) the vision these countries have of fixing the corrupt and sickening world order guided by Washington. In more recent times, this strategy of war based on (spurious) justifications has added a new type of ploy that is much more subtle and suitable for imperialist ends. Since Washington has lost the ability to decide the situation on the ground in different war theaters like in Iraq and Syria, it settles for sowing chaos and destruction. This is done through the employment of plausible deniability, which helps mask covert operations. An example can be seen in Syria, where Washington arms the Free Syrian Army (FSA), an insurgency group labelled "moderate rebels", but these weapons somehow seem to find their way into the hands of Al Nusra and Daesh. This situation has been going on for years, with Washington using Daesh and Al Nusra to fight against Assad, being able to plausible deny doing so by professing to be only arming the moderate rebels and not the extremist terrorists. Clearly we are facing an obvious case of plausible deniabIlity. The United States claims to be arming only the "rebels" in its efforts to remove Assad, but in reality these rebels do not exist and are merely different acronyms for various Islamist extremists. It is therefore natural that the arms given to the rebels will wind up in the hands of ISIS or Al Nusra. On the rare occasions that journalists enquire as to how US weapons have ended up in the hands of Daesh or Al Nusra, US authorities can plausibly deny that they are intentionally arming any extremist groups. Plausible deniability and justifications for war are two manifestations of the hallucinatory world in which we live, based on conjurations rather than reality. No newspaper or journalist questions whether the justification given for war is legitimate. No newspaper wonders whether Iraq really was linked to Al Qaeda, preferring instead to repeat US propaganda. No one bothers to dig and ask whether the FSA is just an acronym like the SDF and therefore another way of plausibly denying and covering for America’s illegal involvement in Syria. Clearly there is no justification, or any plausible denial, that can exonerate the United States from the seventy-year attempt to consolidate its power over other countries or prevent them from pursuing foreign policies independently of Washington. But what is increasingly noticeable is how, thanks to more and more good reporting from alternative news sources, the justifications for war and plausible denials carry less and less credibility with the wider population. Decades of lies and omissions have convinced the European and American populations that the press is probably more interested in protecting the interests of its management and owners than it is in revealing the truth. As a result, the alternative press, online media, and alternative giants like CGTN, RT, TeleSUR and PressTV widen their audience simply by exposing how the Western media's packaged truth only aims to justify the deployment of Western troops to foreign countries, or provide plausible deniability for their less palatable covert operations. The new perspective provided by the alternative media is ripping apart the lies of the past regarding Iraq, Syria, Yemen or Donbass, showing as fabrications the justifications used to drop bombs, kill civilians, subjugate entire populations in order to advance the US geopolitical goals. The world population is increasingly better informed thanks to widespread Internet access and a growing thirst for news. This phenomenon is beginning to gain steam as the deceptions of the mainstream media are increasingly being called out with every passing day. CNN, The New York Times, Al Jazeera, the BBC, and many other broadcasters and newspapers have for many years shown European, American and Middle Eastern populations a partial, falsified and manipulated version of reality for the purposes of justifying criminal actions and providing plausible-denial cover to enable the sneaky killing of even more innocents. As the chickens are coming home to roost, more and more old statements made by US officials are revisited and measured against new facts on the ground. Obama's words about how the US never gave weapons to ISIS are today contradicted by evidence of the perverse flow of weapons from the US and her allies to Daesh terrorists. In the same way, Clinton’s celebration over Gaddafi’s death ("We came, we saw, he died"), or Madeleine Albright’s justification of the death of 500,000 Iraqi children as a result of US sanctions, as well as them bombings from 1991 to 2003, are coming back to haunt them. All these lies are exposed years later, delivering a devastating blow to the Western establishment’s credibility. The three examples of Iraq, Libya and Obama himself represent the greatest expression of American deception, namely, the portrayal of the US as fighting for a noble cause, sacrificing itself for the sake of humanity in order to confront and overcome tyranny. But reality paints a different picture, showing the US as the bringer of chaos and destruction. It is the revelation of these lies more than anything else that can accelerate the global awakening and complete the rejection of imperialism that relies on false justifications and plausible denials to succeed. With the credibility of their previous arguments shot to pieces, the corporate media find themselves with the now practically impossible task of attempting to deceive a woke population that can no longer be fooled as easily as in the past. People are fed up with war and the lies that are offered to justify them, and they are starting to understand the techniques and keywords employed to justify US Imperial policies.